The Breitling Cockpit B50 Orbiter is one of those weird Breitlings that are, at once, hard and easy to love. The piece honors the first non-stop round-the-world trip in a balloon, originally achieved by balloonists Bertrand Piccard and Brian Jones on March 21, 1999. The watch, which features a SuperQuartz movement, has a handsome engraving on the back celebrating the feat. The watch is powered by the Breitling Manufacture Caliber B50: a thermocompensated SuperQuartz™ analog and digital display movement designed in-house that delivers ten times the accuracy of a standard quartz watch. 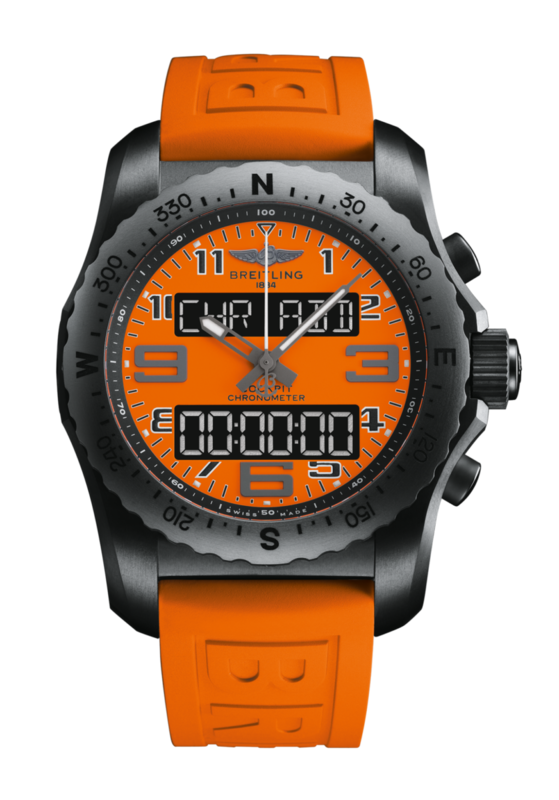 The Cockpit B50 Orbiter is a COSC-certified chronometer that includes functions that will prove particularly useful even on the most extreme missions.In addition to the chronograph with split-time and fly-back capabilities, this model features a second time-zone display, a perpetual calendar, two alarms with buzzer and/or vibrate mode, a lap timer function and a countdown complete with its own alarm. And that is only the beginning. The Cockpit B50 Orbiter is equipped with an electronic tachymeter, a count-down/count-up system, and a chrono flight device, which records flight times by memorizing departure and arrival times as well as the date. The watch is limited to 213 pieces and will be shown at Baselworld this year. No pricing yet, but if you can afford a balloon that can float around the world then you can probably afford this thing.